PLAYGROUPとしても知られるTREVOR JACKSONが主宰した伝説的レーベル:OUTPUTから. 1999年にデビュー、2003年にファーストアルバムを発表し当時のOUTPUTでは異色とされつつも. その陰鬱ながらも甘美なエレクトロニックサウンドが話題を集めた幻のユニットが遂に復活!?. COLDER ~ JOY DIVISION ~ MASSIVE ATTACK ファン注目!!! 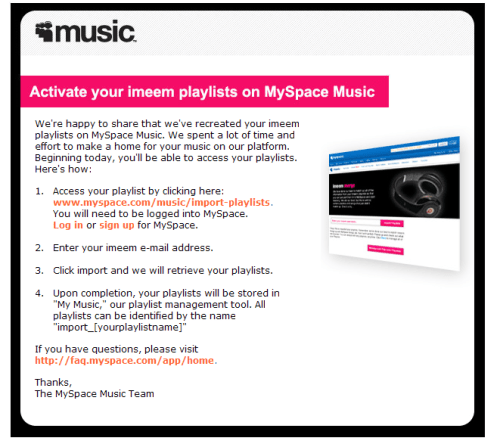 The MySpace Music team is working around the clock to duplicate your imeem playlists and make them available to you on myspacemusic.com as soon as possible. 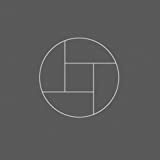 In the coming weeks, we will be emailing you with instructions on how to claim your playlists on MySpace Music, using your MySpace login. If you don’t have a MySpace account you can sign up for one here.